By early fall most stillwater hatches are complete. With the exception of boatman and backswimmer falls and the odd chironomid emergence trout focus their fall feeding binges on staple sources. Staples are prey items that have completely aquatic life cycles such as scuds and leeches, damsel and dragon nymphs that spend extended time in their nymphal form and chironomids, famous for their near season long hatch cycles. 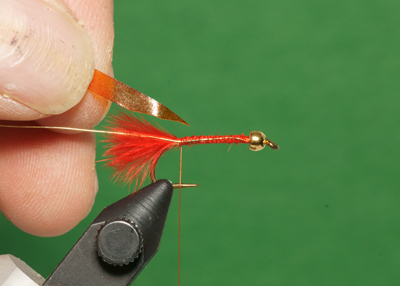 Most fly fishers to use prefer larger or more popular staples; leeches, dragon nymphs and chironomid pupa. 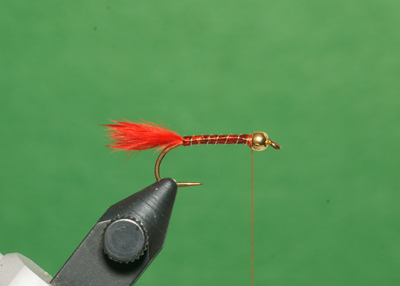 But there is one staple that consistently slides under the radar of many, chironomid larva or bloodworm. Chironomid larva are simple, nothing more than a slender segmented translucent worm. Yet, as with all flies, there are pattern keys that must be taken into account for consistent success. These include color, profile/shape and movement. Bloodworm often live in oxygen poor regions such amongst the bottom debris and detritus where they live and feed. Larvae, in need of an oxygen supplement, generate hemoglobin in order to survive that turns them scarlet or blood red. As a result, red and maroon are the most common larval colors. Other larval colors include olive and green. As lake water cools during the fall and is re-energized through the turnover process hemoglobin infused larva return to their natural colors. It is common to see transitional larva featuring distinct alternating bands of red and green. Holographic Mylar and Flashabou are excellent body choices. These bright materials stand out amongst the suspended matter that often clouds nutrient rich muddy bottomed lakes. In clear water I recommend covering these materials with stretchy products such as Midge Flex, Scud Back, SuperFloss, Midge Stretch Floss and V-Rib to subdue these overt materials. Glass beads, marabou and yarn strands are also excellent body choices. Color contrast is an important pattern element. In addition to suggesting segmentation and reinforcement rib color plays a role. Wire ribs are my preferred choice as they help maintain the slender profile necessary for success while reflecting trout attracting light. Jack Shaw recognized the angle of the sun and its impact on his rib colors. A philosophy I subscribe to. Light levels also have an effect. During the spring, when the angle of the sun is high, and on bright days I use silver ribbed patterns. During the fall months when the angle of the sun is acute gold and copper ribs seem to work best. Bloodworm have nine body segments. Don’t worry about them when winding the rib forward. Use open even wraps to create a sense of balance to your bloodworm patterns. I doubt fish can count. Fluorescent colors are also worth incorporating. Jerry McBride, originator of the balanced fly concept, integrates fluorescent colors in his unique Bionic Worm, a pattern similar to my Holo Worm. 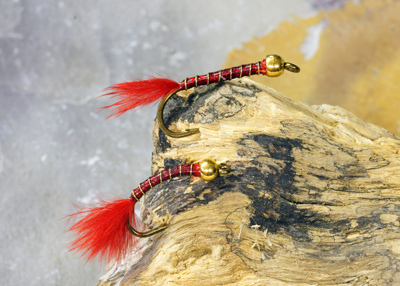 As opposed to the red marabou tail copper or gold bead of my Holo Worm, Jerry uses fluorescent orange or pink beads and marabou tails to contrast to the red body. Bright fluorescent colors offer stark contrast at depth, prime chironomid larva habitat. Tie a few of Jerry’s Bionic worms, they drive rainbow trout nuts. As with chironomid pupa patterns, bloodworm designs must be slender. Get in the habit of securing materials along the length of the shank to maintain smooth even profiles. Efficient thread discipline is also required. Thread wraps must be kept to a minimum. When tying off stretchy materials such as Stretch Flex I always add a whip finish or half hitch. Should I bump the bobbin the thread wraps won’t slip and allow the body material to unravel, a frustrating experience that often happens as you wind the ribbing forward. The final pattern key is movement. 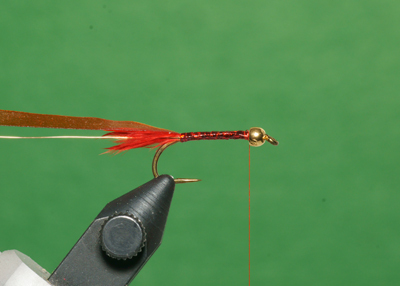 Bloodworm move with a vigorous head to tail lashing motion coupled with rests in an extended position. 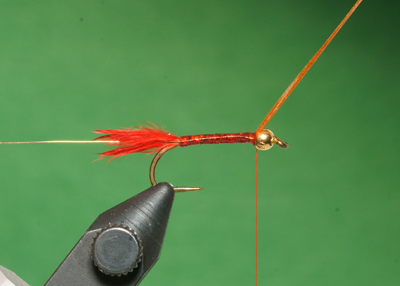 The lashing motion is nearly impossible to duplicate but we can add a touch of mobility to our flies nonetheless. Hook style plays a role. Straight shank hooks represent resting larvae. Patterns tied on curved shank scud hooks coupled with non-slip loop knots and suspended under an indicator in a slight chop or powered by a slow handtwist retrieve suggest wriggling bloodworm. As with chironomid pupa, I tie patterns using both hook styles and let the trout tell me which one they prefer on any given day. 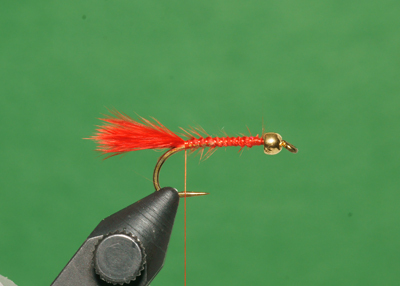 Soft flowing materials such as marabou and hackle fibers incorporated into the fly also suggest movement. Soft hackle fibers don’t represent any bloodworm feature but their movement can provide a key trout trigger. Jack Shaw used a sparse pheasant rump hackle to provide ‘proof of life’ for his signature bloodworm. I still use his pattern from time to time along with patterns utilizing sparse marabou tails and Midge Stretch Floss or SuperFloss tails and antenna. Long dangly Stretch Floss legs and antenna, although not a bloodworm feature, can stimulate a confident response from trout. Beadhead patterns sink quickly and augment motion by providing a pitching action to the fly. I use both brass and tungsten beads. I prefer tungsten beads when plying deep water using a floating line and long leader, under indicators and in windy conditions when circulation currents affect sink rate and fly performance. When using floating lines and long leaders between 15-25 feet to cover water between 14-18 feet I favor brass beads as their sink rate blends perfectly with the painstakingly slow retrieves necessary for this method to produce. As you head out for your final stillwater forays of the season make sure the bloodworm side of your fly box ledger is stocked and ready. These slender simple patterns often outperform other popular fall choices. 1) Slide a gold or copper bead onto a de-barbed hook forward to the hook eye. Attach the tying thread directly behind the bead. 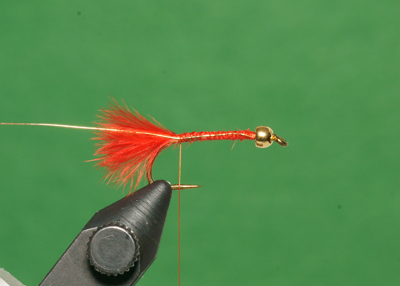 Tie in a sparse clump of red marabou directly behind the eye and secure back to the bend of the hook. Maintain a slender smooth profile when securing the marabou. Pinch the marabou to length, about half the hook shank long. 2) Return the tying thread to the rear of the bead. Secure the ribbing along the near side of the hook from the rear of the bead to the base of the tail. 3) Trim the end of a length of Stretch Flex to an acute point. Tie in the prepared Stretch Flex by the point just back from the bead. Once you are confident the point of the Stretch Flex is secure pull tight to reduce bulk and secure the Stretch Flex along the top of the hook shank to the base of the tail. 4) Tie in the holographic Mylar at the base of the tail. Wind the Mylar forward to the rear of the bead to form the underbody. Tie off and trim the excess Mylar. 5) Wind the Stretch Flex forward over the Mylar underbody using firm tight wraps to reduce bulk and maximize translucence. Tie off and remove the excess Stretch Flex. Whip finish or half hitch the thread but do not trim. As the Stretch Flex body material is under tension placing a whip finish or half hitch ensures the body does not accidently unravel should the thread accidently slip if the bobbin gets bumped. 6) Wind the rib forward over the body using open even wraps. Tie off directly behind the bead and using a twisting and pulling motion break away the excess. 7) Build up a subtle thread shoulder directly behind the bead. Whip finish and trim the tying thread. Coat the tie off area and body with brushable superglue for added durability and shine. Be careful not to get any glue on or in the marabou tail.